The Clinton Van Vliet residence built c. 1899 in Douglaston. Van Vliet was president of the Goodyear Rubber Goods Company. He began working for Goodyear as a salesman in his early twenties and three years later had become vice president. 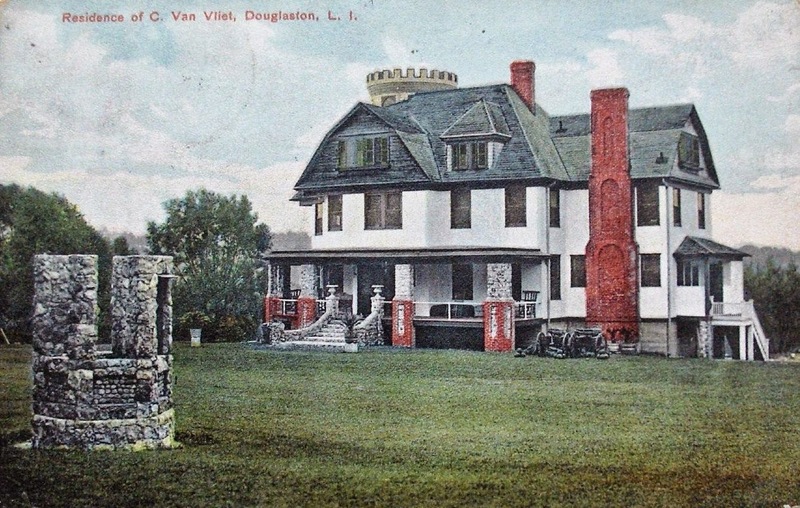 Van Vliet collected stones from all over the world which he shipped back to New York and incorporated into his home at Douglaston. Following Van Vliet's death the house served as P.S. 98 until it was demolished in 1930 and replaced with a modern schoolhouse. & the stones from all over the world are now re-scattered. I wonder what criteria Clinton Van Vliet used for selecting them? Curious (to me) is the prominent chimney on what is most likely the servant's wing while the castle turret (wish my house had one ... wait, no I don't)is beside / behind. What an interesting style of house. Did this sit on many acres? Anonymous 7:01PM -- thanks for the later picture. I hope they used the turret roof from which to conduct science projects.